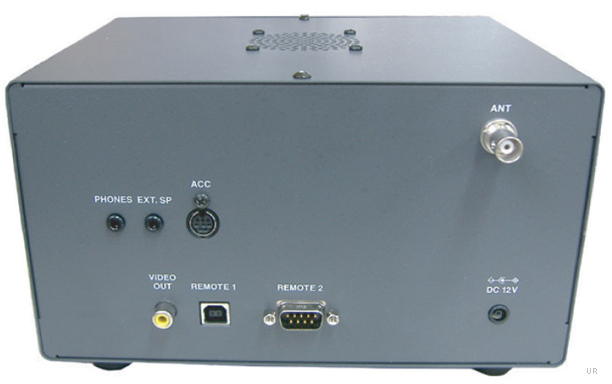 The AOR SR2000AU is a DSP powered spectrum display unit with high quality RF front-end, for professional users. 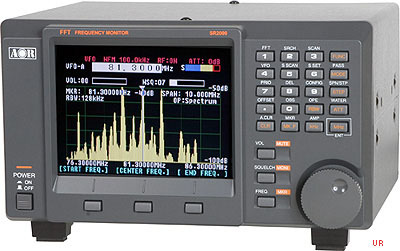 The IF signal originating from the RF’s front end is digitally processed, analyzed by high-speed FFT (Fast Fourier Transform), to allow a 40 MHz bandwidth wide spectrum to be displayed in real time. The FFT search can scan 10 MHz in as little at 0.2 seconds to instantly detect, capture and display transmitted signals. The RF front end covers a wide range from 25 MHz to 3 GHz with triple conversion superheterodyne in AM, NFM, WFM and SFM modes. Thanks to a well designed RFU, the generated IF signal of 10.7 MHz is of high linearity. Moreover, the demodulated signal is amplified to a high-definition audio (AF) signal, which can be output to an external speaker (not supplied) for superb sound. Other feature highlights include: 1000 memories (10x100), 40 search bank memories, easy menu-driven operation and both USB and RS232 ports. Scan Width Up to 40 MHz. The AOR SR2000AB consumer version is identical, but has the former cellular frequencies blocked. The AOR SR2000A can be purchased for government or for export only. This special order item is not available via on-line ordering. Please note that American broadcast television stations converted to a digital format on 02/17/09. After this conversion you cannot view broadcast television with this receiver.